Vasily Kafanov is a distinguished Russian-born painter and we love seeing his graphics come through our presses. We are big fans of his “Dream” skateboard series which is why they are today’s BoardPusher.com Featured Decks. You can view various collections by, as well as purchase skateboards from, Vasily at kafanov.com or follow him on Instagram @fishtower. 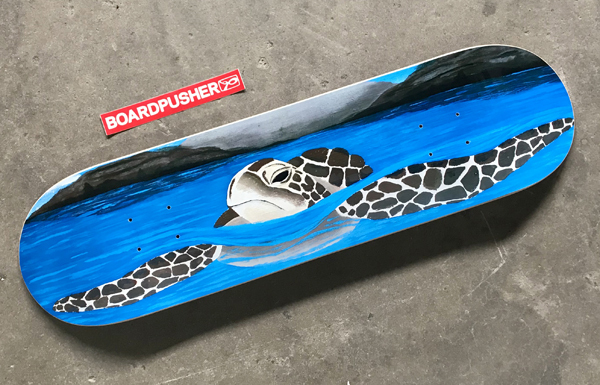 From beginners to the most experienced, BoardPusher.com makes it easy for you to create your own custom skateboard graphic. 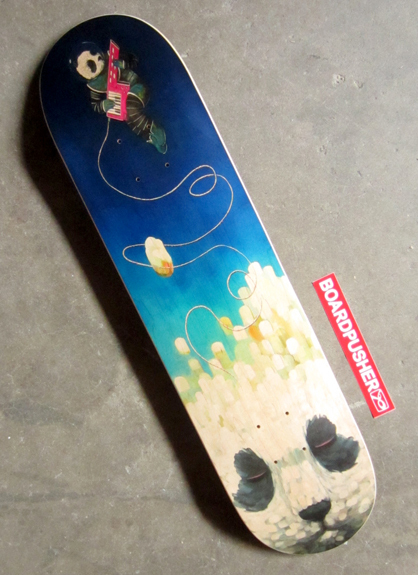 Today’s BoardPusher.com Featured Deck is the final skateboard design created by the Lane Tech high school Art 1 class. “Underworld” was painted by student ZOË Gordon, “My skateboard design was inspired by the style graphic novels are illustrated in because I like the vibrant color and small details that make the art pieces come to life. This is important to me because my art usually tells a story and I like to capture the comic book format.” All of the art class’ skateboard graphics can be found here. 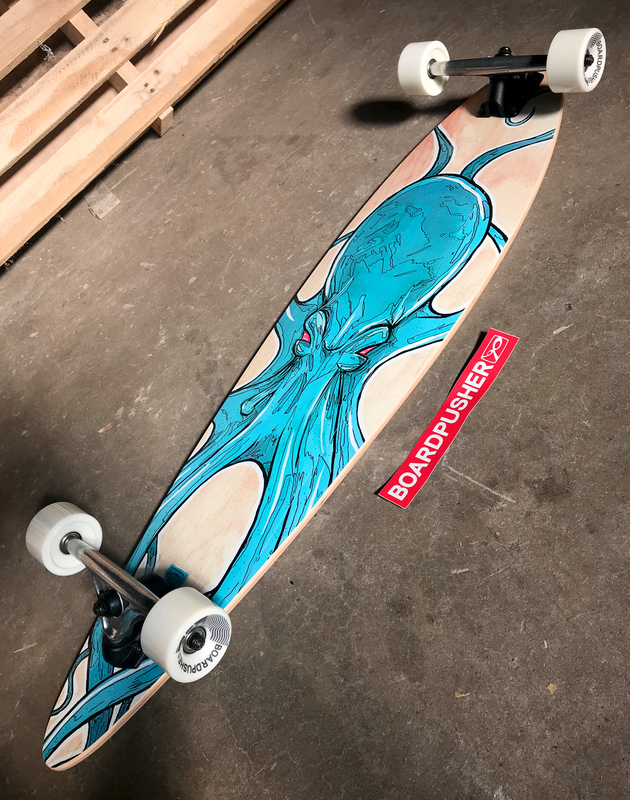 Turn your art project into a custom skateboard deck at BoardPusher.com. We have reached the penultimate design of our Lane Tech high school Art 1 class Featured Decks. Again, these graphics were painted and then digitally transferred to create custom skateboards at BoardPusher.com. “Endangered” was painted by Megan Gallian, “Nature is one of the most under appreciated and beautiful creations that our planet has. Each day, deforestation threatens the numerous animal habitats in the rainforest, leaving many species on the brink of extinction. My board displays the color of the rainforest and its beauty. It also reveals how nature is not man-made or manufactured and how it needs to be preserved in order for species to exist. 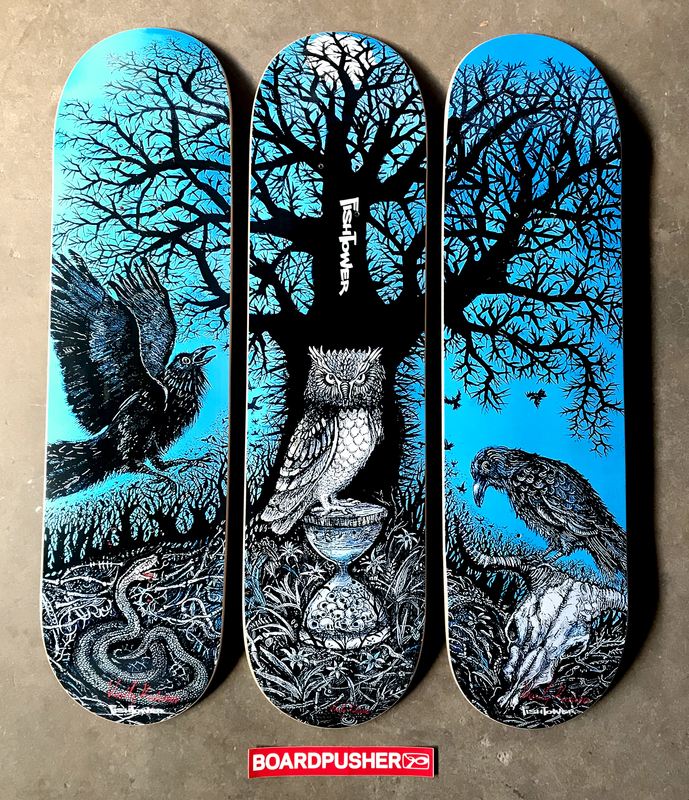 My board brings to life the idea that humans need to realize their interdependence with plant and animal life for their own existence.” You can all of the Lane Tech skateboards here. Customize your ideas into a skateboard graphic at BoardPusher.com. Another painting turned custom skateboard graphic from the Lane Tech high school Art 1 class. “Totem” was done by Bianey Iman and it’s today’s BoardPusher.com Featured Deck. “Patience, strength, protection, stability, and longevity are some of the things that we can learn from this beautiful creature.” You can check out the other students’ art here. No matter your preferred medium, transform your artwork into a custom skateboard graphic at BoardPusher.com. Only a few more Featured Decks left from the Lane Tech high school Art 1 class. 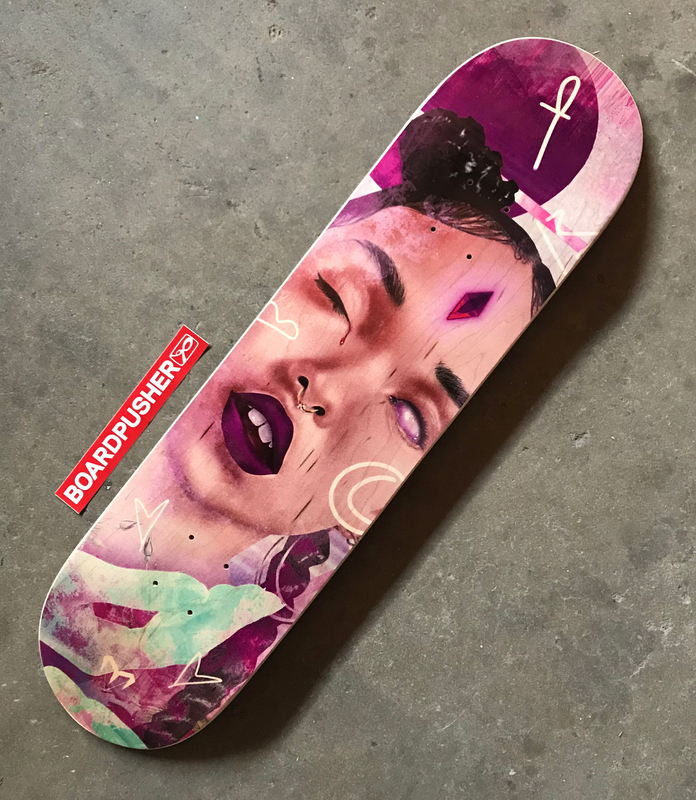 “Criticized” was painted by Fhatiha Fazilatun before being transferred digitally at BoardPusher.com to create this custom skateboard graphic. “This piece captures the never-ending hate and critique of women no matter the creed, color, or shape. This hate often becomes the women. It breaks down their self-esteem and self-worth. This piece is a silent homage to the suffering these words have caused.” View the rest of the graphics design by the art class here. Make a statement with a custom skateboard graphic created at BoardPusher.com. 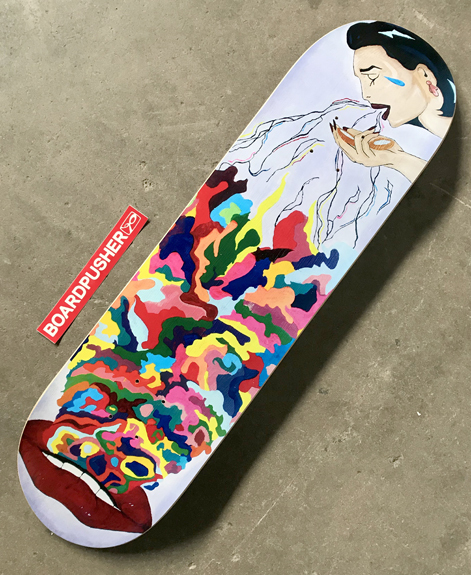 Moving through the Featured Decks from the Lane Tech high school Art 1 class, “Alone With Her Thoughts” was originally painted by Giselle Arista-Velazquez before being digitized and made into a custom skateboard graphic at BoardPusher.com. “This piece is inspired by another artist who makes paintings about women finding precious alone time in the bathtub. I wanted to make something vulnerable but strong.” Find the rest of the skateboard graphics from the class here. 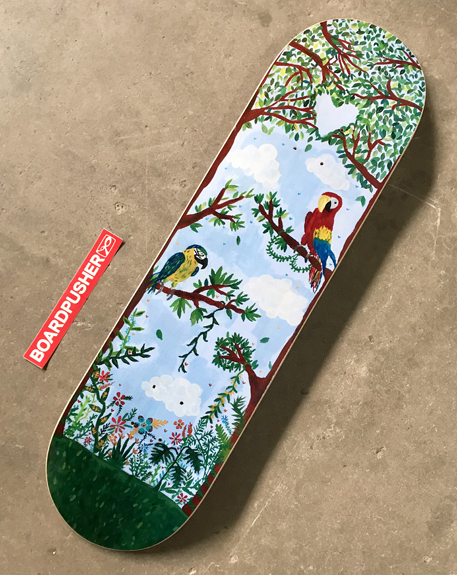 Make your very own artwork a custom skateboard graphic at BoardPusher.com. We keep rolling through these Lane Tech high school Art 1 class paintings that were digitized for custom skateboard graphics. Today’s BoardPusher.com Featured Deck was painted by Kevin Rula. “Ever since I was a little kid, I’ve had a love for cars because of my dad. The ones that interest me the most are old cars. 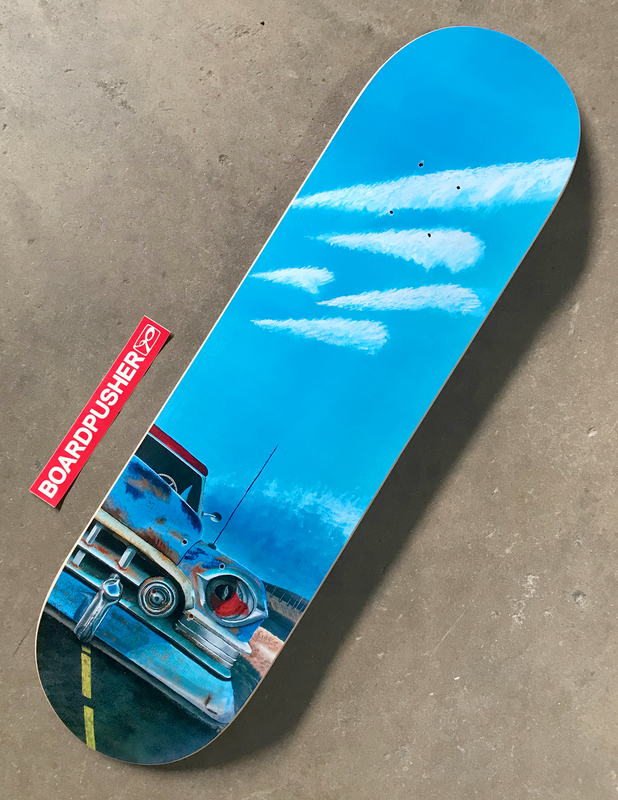 That’s the reason I picked an old Cadillac to paint on a skateboard.” You can find the rest of the skateboard designs from the class here. Create your art on a unique custom skateboard canvas at BoardPusher.com. Nathan Durfee is correct, we all fantasize about floating in space playing a keytar, right? Why wouldn’t panda bears have the same dreams? 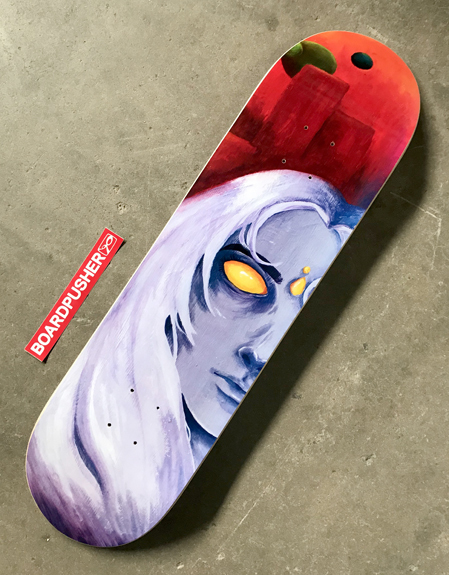 Today’s BoardPusher.com Featured Deck was originally created as an oil painting. Nathan has so many more paintings that you can view here or follow him on Instagram @nathandurfee. Make your dreams come true by designing them as a custom skateboard graphic at BoardPusher.com.